DeLonghi kettles are designed to add a special touch of Italian style to your kitchen. The distinctive Italian brand produces kettles in a rainbow of colours to complement your decor. Combining designer appeal with the best technology, this is a range that delivers functionality as well as great looks. Each DeLonghi kettle is designed with the wider DeLonghi kitchen collection in mind, so it’s easy to pair up and accessorise your kitchen with matching toasters and coffee makers for a smart, themed look. The high-tech Distinta has a digital base to control water temperature for the perfect cup of tea every time. 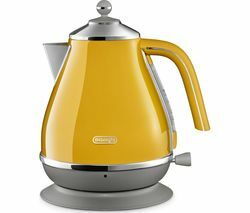 It makes it easy to boil water at the ideal temperature for different tea types - white, yellow, green, oolong and black. With a keep-warm function, it can maintain your selected temperature (75 – 80 – 85 – 90 – 100°C) for 20 minutes. The Icona Vintage has a sleek and sophisticated retro design, but all the power of modern with a rapid boil concealed element. Choose from a range of gorgeous painted stainless steel options in stylish high-gloss finishes. The futuristic Brillante is inspired by three-dimensional design. Its sci-fi looks come courtesy of a uniquely faceted plastic body, and is available in striking red, white or black. The Scultura range is simple to fill thanks to an easy-fill spout, features rapid boil, and takes its inspiration from classic Italian stove-top coffee makers. All of our DeLonghi kettles offer 1.5 - 1.7L capacity, 360° detachable swivel base for cordless convenience, and a removable, washable anti-scale filter. 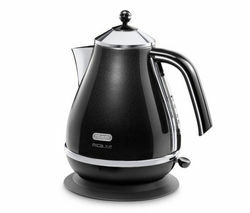 There are three levels of safety protection as standard: auto shut-off when water begins to boil, thermal cut-off and auto shut-off when the kettle is lifted from its base. With built-in cord storage, it’s also easy to keep your counters clear of cable clutter. For more stylish ways to brew your perfect cup, take a look at our full range of Breville kettles and Russell Hobbs kettles for a wider selection of colours, styles and features.